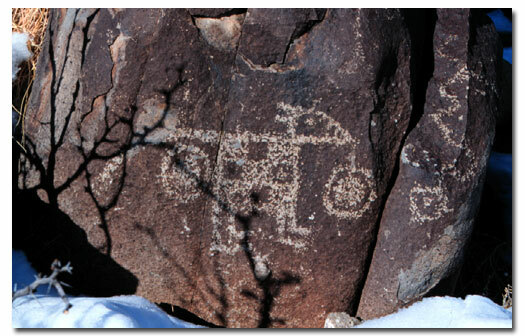 The Three Rivers Petroglyphs site is one of the few locations in the Southwest set aside solely because of its rock art. 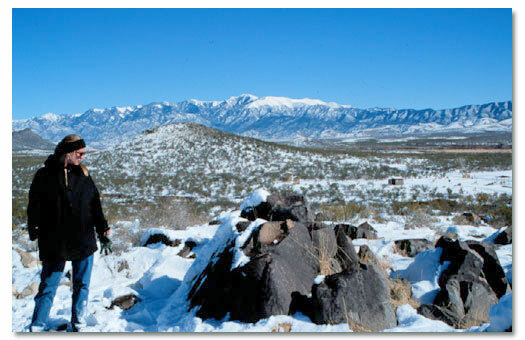 It is also one of the few sites that gives visitors such direct access to petroglyphs. 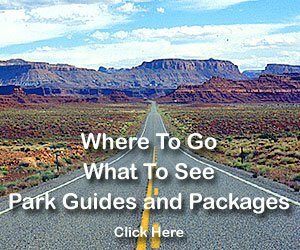 The number and concentration of petroglyphs here make it one of the largest and most interesting petroglyph sites in the desert southwest. More than 21,000 glyphs of birds, humans, animals, fish, insects and plants, as well as numerous geometric and abstract designs are scattered over 50 acres of New Mexico's northern Chihuahuan Desert. 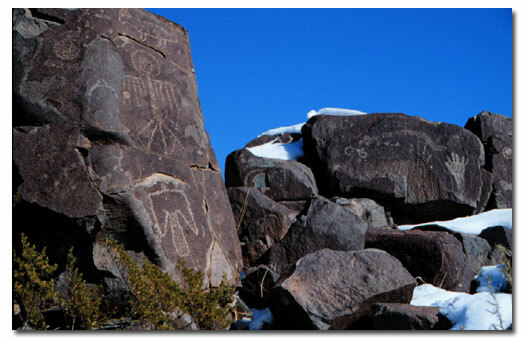 Most of the petroglyphs here decorate a long, basalt ridge rising from the upper Tularosa Basin at the base of the Sacramento Mountains. 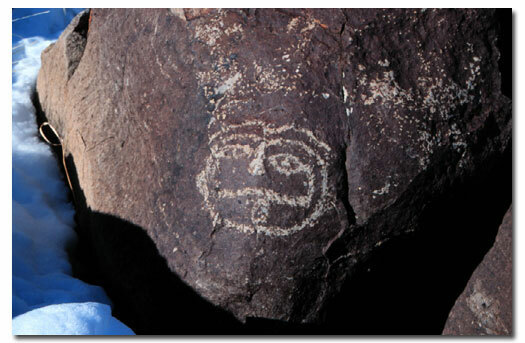 Petroglyphs at Three Rivers were created by Jornada Mogollon people between about 900 and 1400 AD. A short interpretative trail 200 yards south of the petroglyphs leads to the remains of the Mogollon village, whose inhabitants were likely responsible for the petroglyphs. The site, which was partially excavated in 1976, was occupied for about 400 years. Foundations of three types of prehistoric buildings can be seen here. The one-mile, round-trip trail along the ridge winds through thousands of petroglyphs created over a period of a few hundred years. Trail markers, which correspond to the trail guide provided upon admission, indicate petroglyphs of particular interest along this somewhat rugged route. Archaeologists refer to the agricultural, prehistoric inhabitants of southwest New Mexico and southeast Arizona as the Mogollon. Those who lived in the mountains are referred to as the Mimbres Mogollon while desert dwellers such as those who lived here on the banks of Three Rivers Creek are called the Jornada Mogollon. The Mogollon lived in pithouse and adobe structures similar to their agricultural cousins the Anasazi, with whom they traded. And like other prehistoric agiculturalists of the Southwest, by the time the Spanish entered New Mexico in the 1500s, the Mogollon had already mysteriously abandoned their pueblos. Residents of Three Rivers village are believed to have fled to pueblos in northern New Mexico, or to have resumed their ancestors' hunting and gathering lifestyle. There is a per person fee payable upon entry to the park. Open to the public daily, year-round. No pets. This is a gated area. 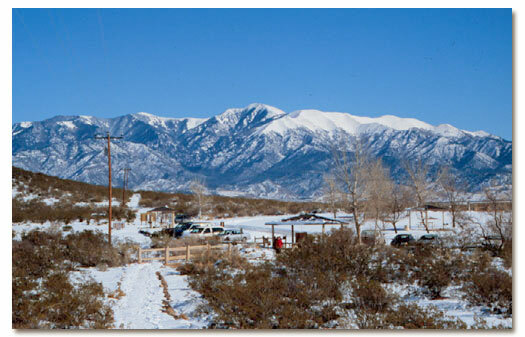 At the parking lot, visitors find six shelters, picnic tables, barbecue pits, trash cans, drinking water and toilets. Overnight camping is permitted. The Three Rivers Petroglyph site is located 17 miles north of Tularosa, New Mexico and 28 miles south of Carrizozo, New Mexico on U.S. Highway 54. Turn east at three Rivers, on to County Road B30, and follow signs for 5 miles on the paved road.